A very dear friend and I were catching up recently and talk of our blogs came up. She writes a sweet food blog called Food Filled Life and has a true passion for cooking, using fresh and local ingredients, often from her own backyard or the amazing CSA that she uses up in Oregon. When we get a chance to reconnect, we mostly talk about what we are making and how our kids are growing and changing and often we give each other feedback on our respective blogs. I trust Jill immensely…she was the very first “mom” friend I met here when I moved to Napa and even though she has since moved up to OR, our friendship stays strong. So, I’m dedicating this post to her, because she asked for a tutorial “of some kind”. I told her I didn’t really have anything to share that was “tutorial worthy”, but that I would think about it. As I’ve been spring-cleaning and rearranging my studio over the last several weeks, I started to go through the piles of “to- do” bins, like: clothes that need to be altered, sweaters that need to be felted…and t-shirts that need to be turned into yarn. Ah-ha, I thought…that could be a fun tutorial. (Because really…shrinking wool sweaters is not too difficult). There are probably a dozen or more tutorials on this already. I’m not trying to reinvent the wheel here, folks… just giving you the chance to try your hand at repurposing some old t-shirts. 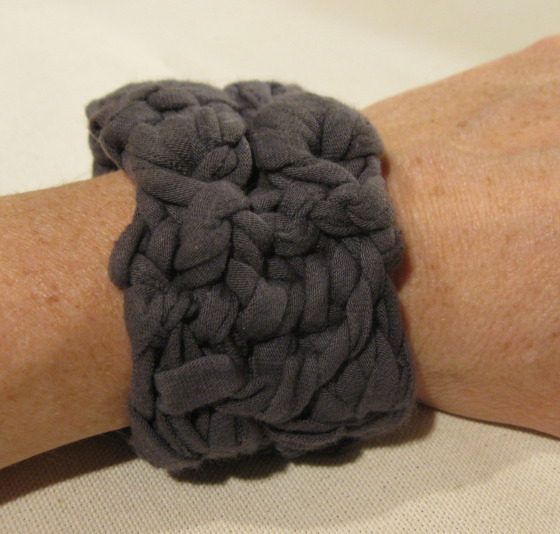 I plan on making a shoulder bag from this yarn, but I have made wrist cuffs with it in the past and there are several patterns on Pinterest for rugs…if you are feeling that ambitious. 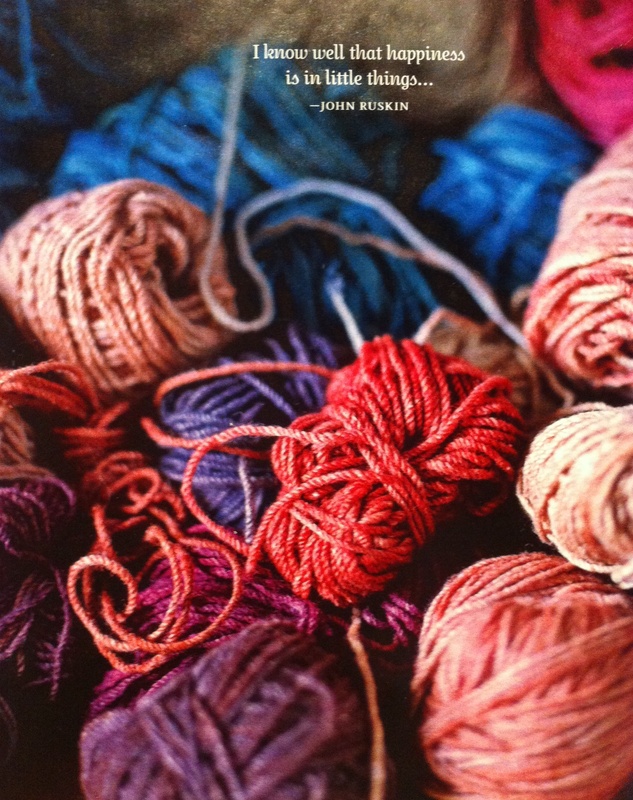 *a note about t-shirts: not all shirts will work to make a “yarn” that you can easily crochet with. You want to find t-shirts that have some elasticity in them and are soft cotton. The thicker type of t-shirts (mostly men’s…think brands like “Carhart”) are too rigid and bulky to turn into yarn. 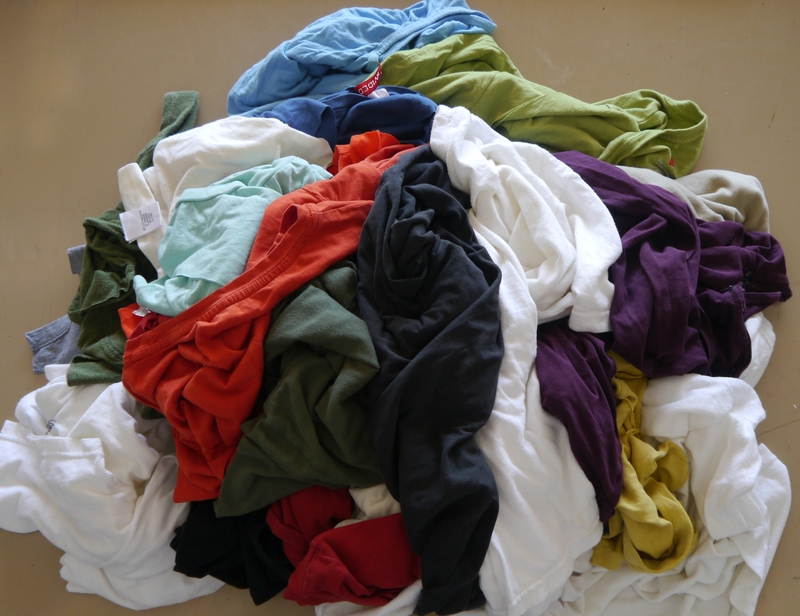 In my stash, I had mostly women’s shirts…the soft and cozy type. 1. 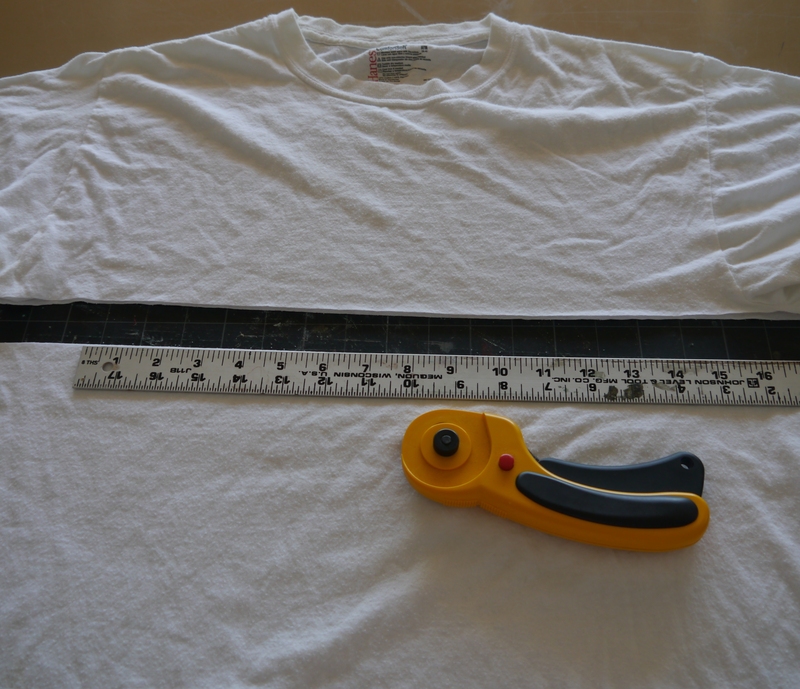 Flatten out your t-shirt so that the bottom seams line up and there are little to no creases. 3. 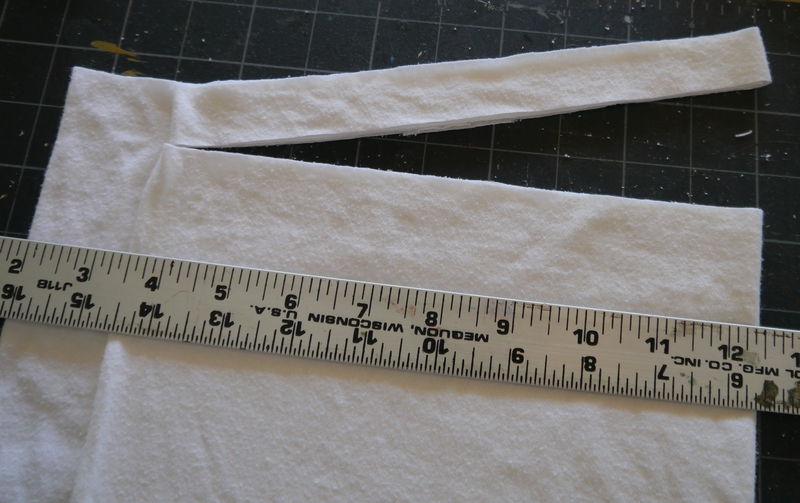 Make a straight-line cut just under the armpits of the shirt, keeping it in line with your bottom cut. 4. Now you have, more or less, a rectangular shape. 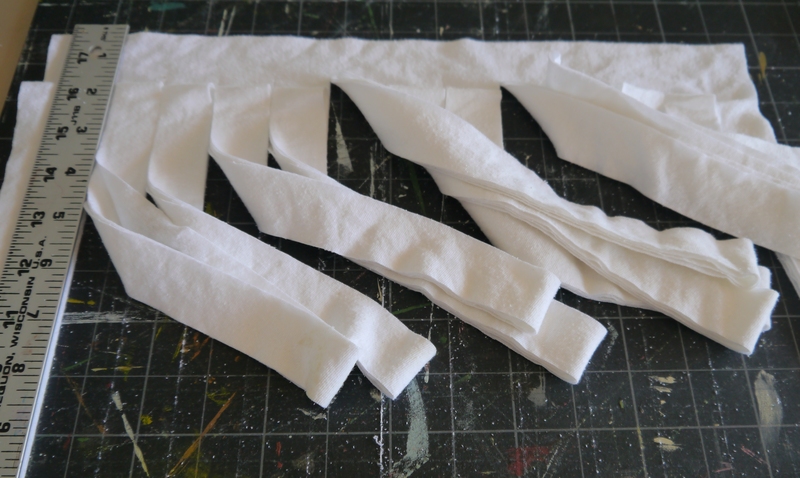 Fold the right side over the left, leaving about a 2″ gap…meaning, don’t fold it all the way across to the other side. 5. 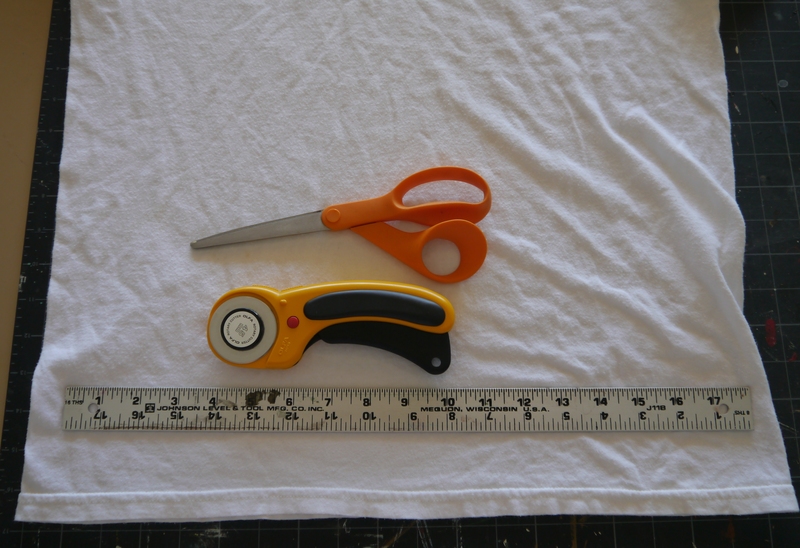 Place your ruler about 1″ in from the top of the folded shirt and cut up until the first fold…meaning, don’t cut all the way through to the end. 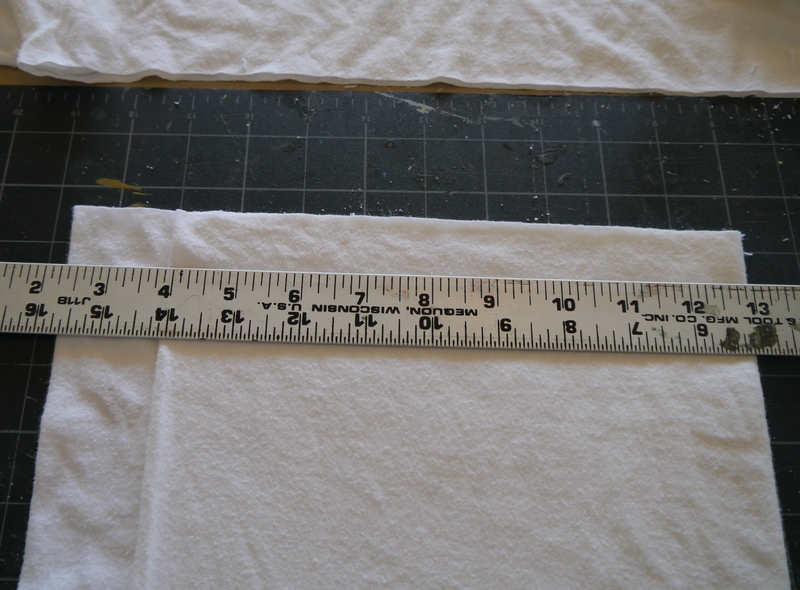 6.Continue to cut 1″ strips until you come to the end of the fabric. 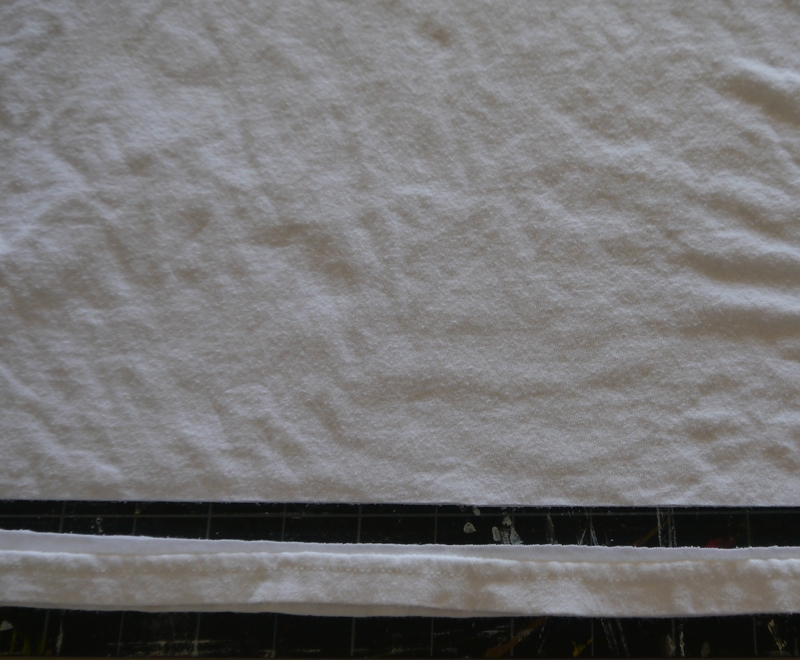 Usually the last cut should go all the way through so that you are making a nice, straight edge for your final row. 7. Now you are ready to open up your strips. 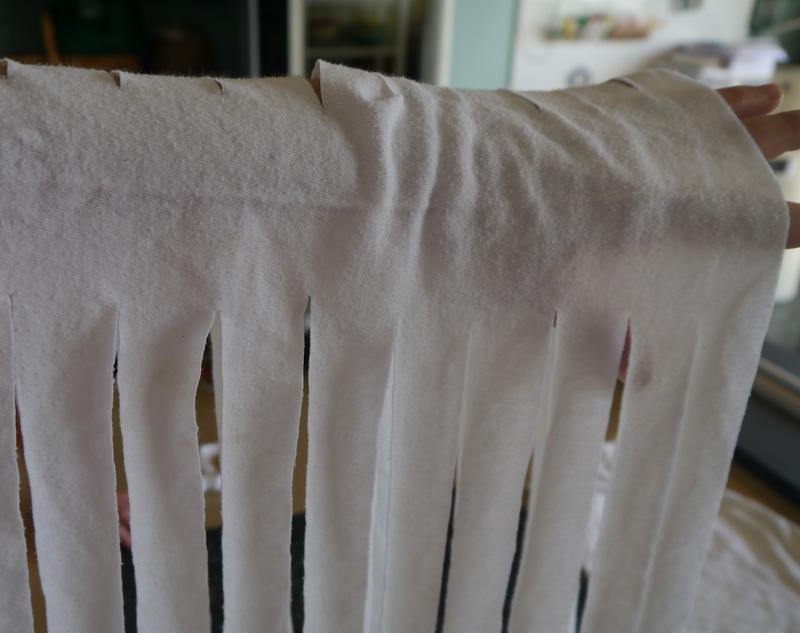 Hold the fabric from the left side and slide your arm through, setting all of the strips free. 8. 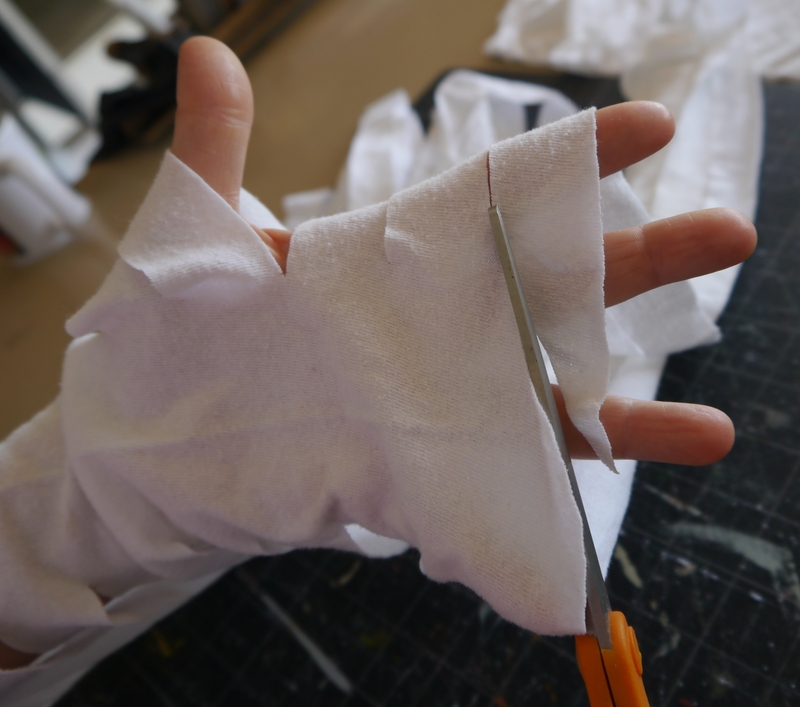 Cut from the outside towards your first slit ON AN ANGLE…very important direction. Now you will begin to make a continuous loop of “yarn”. Continue cutting from the bottom right side up to the top left side, always on an angle. Your cuts may not look exactly even and it may not seem like the yarn will come out looking all that homogenous, but it will be fine. Once you stretch it out and begin to work with it, you will never notice the inconsistencies. 9. 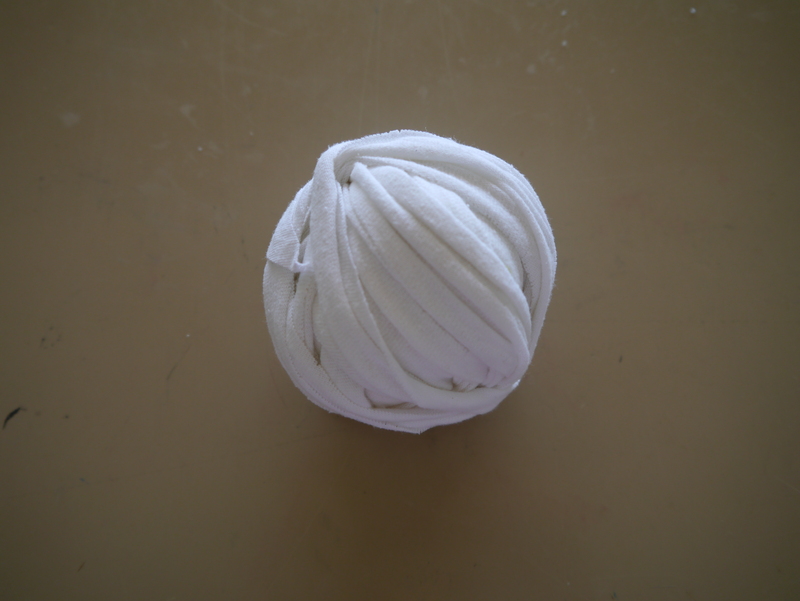 Et Voilà…roll your big, long piece of yarn into a nice little ball and carry on. 10. 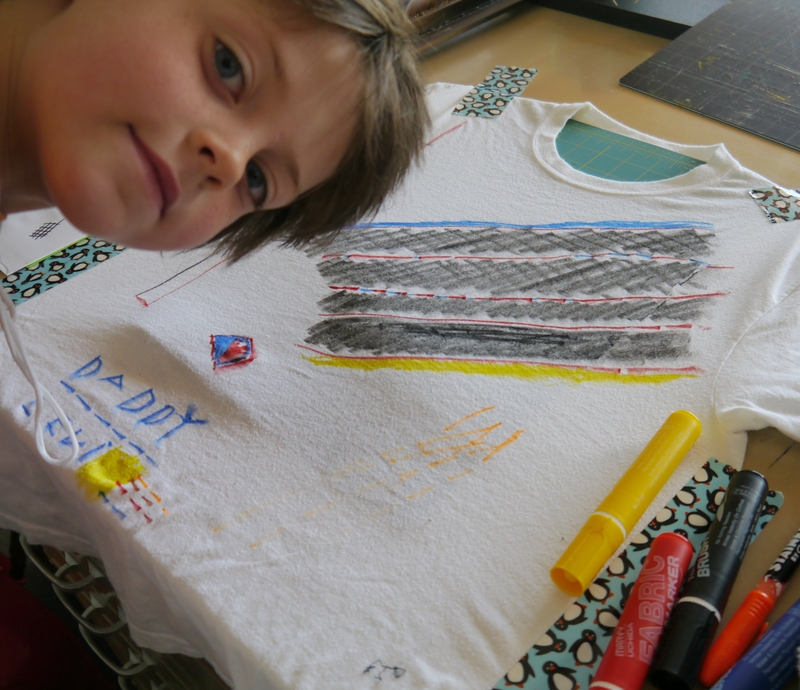 Give your kid a blank t-shirt and some fabric markers and have him work next to you…it makes it so much more enjoyable!